While in general we are against cheating, there are situations when some cheat sheet becomes handy. Not to cheat others, but just to make life easier. Being rather efficient in pH calculations I must admit I never remember proper form of the Henderson-Hasselbalch equation and any time I need it I have to either check what is in nominator and what in denominator, or I have to derive it - it takes about 30 seconds. 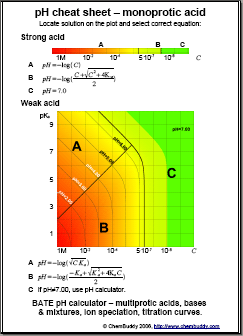 Using pH cheat sheet is just much faster. 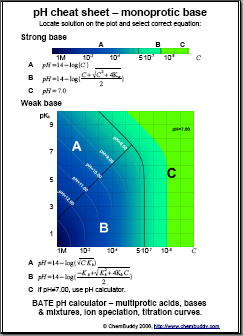 There are two pH cheat sheets that you can download from our site as pdf files - pH-cheat-sheet1.pdf (93kB) and pH-cheat-sheet2.pdf (213kB). 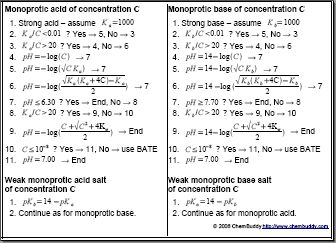 First one allows much more accurate and systematic calculation of pH of any monoprotic acid or base, it also contains some most often used formulas and definitions. Second pH cheat sheet is much faster in use, although less systematic. 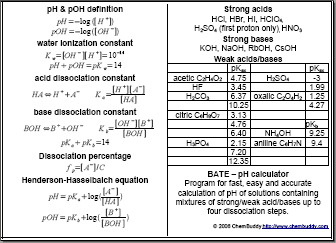 To use any of these pH cheat sheets download the pdf file and print it on both sides of paper, then cut the pH cheat sheet with scissors or knife. pH cheat sheets have size similar to that of the MtG cards. First pH cheat sheet can be then folded in half, so that is is even smaller and can be easily put into calculator case. Please note that the second pH cheat sheet must be printed on good color printer - the higher the resolution and the higher the output quality, the better. First pH cheat sheet can be printed on any good b&w printer - we tested it on almost 10 years old LaserJet 5L and the results were perfect. If you like our pH cheat sheets - and you have your own page - feel free to link to this page: http://www.chembuddy.com/?left=BATE&right=pH-cheat-sheet. Let the word spread out.